The Yellow Brick Road is the difficult path Dorothy takes towards the Emerald City to find the Wonderful Wizard of Oz to help her get home. 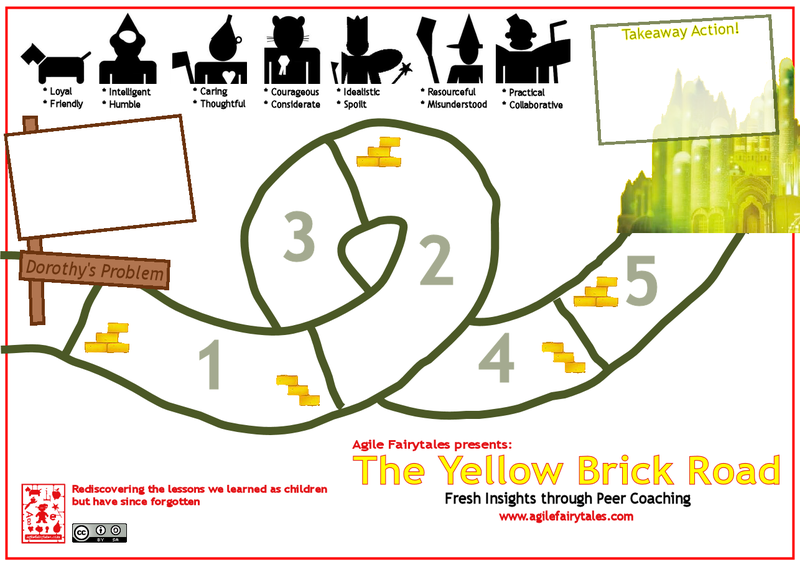 Swap your bit part for a major role in the agile re-telling of ‘The Wizard of Oz’. Let your companions and other characters help you tap into the resources you’ve always had but not yet realised. Put into practice 4 key coaching skills: Questioning, Observing, Listening and Feedback. Experience peer coaching and gain fresh insights on your problems. Work with peers in similar situations and draw on a wealth of different experiences. Come up with ideas on how to deal with real problems. The goal of the Yellow Brick Road Game is to gain fresh insights on a problem you face by looking at it from different perspectives. The overall goal of the session is to give you the opportunity to put peer coaching into practice. [ ] Have you listened without judgment? [ ] Have you gathered information effectively? [ ] Have you learnt from the experience of others? [ ] Have you gained fresh insights into a problem you face? [ ] Have you become a more effective problem solver? [ ] Have you identified and committed to at least one action to try at work? [ ] *OPTIONAL* Have you found a peer coaching buddy to support you in your endeavours towards Continuous Improvement?